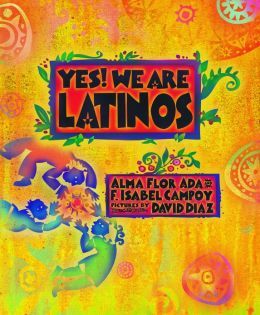 Covering the breadth of what it means to be Latino in the US, Flor and Campoy start each chapter with a statement of who is telling his or her story told in verse. My Name Is José Miguel--not Joe, not Mike. I am Cuban and Nicaraguan. I live in Tampa, Florida. I am Latino. My Name Is Mónica. I am from El Salvador. I live in Houston. I am Texan. I am Latina. Román’s story that illuminates the culture that has been in northern New Mexico for over 400 years. I was also thrilled to learn about the mural, Mundos de mestizaje: The Miracle Wall. It was created by an artist who shares the same last name as three of my great-grandparents and now I must go see it the next time I visit the primos in New Mexico. This is a fascinating and important book that belongs in every school library.